Numerous Black African mercenaries, reportedly bankrolled by Muammar Gaddafi to quell Libya’s popular revolt, have taken part in the bloody crackdown by the north African country’s authorities. A situation that has seen many black African migrant workers in Libya bearing the brunt of the violence as Libyans continue to take them, voluntarily or involuntarily, for mercenaries. They have become the unfortunate victims of revenge. Thousands of them are reportedly in Libya to kill. Hired by Colonel Muammar Qaddafi to quell the popular revolt that risks kicking him out of power, the mercenaries are taking part in a bloody repression that is believed to have so far taken over 6000 lives, according to the Libyan League for Human Rights. Reportedly from diverse countries, including Chad, Mauritania, Sudan, Somalia, Zimbabwe, Liberia… and estimated to number around 6,000, by the International Federation of Human Rights (FIDH), and 30,000 by Human Rights Solidarity, these mercenaries are said to be comprised mostly of veteran rebels of wars that have been financed by the Libyan "Guide" in Sub-Sahara Africa since his ascension to power in 1969. Kenyans, Ethiopians and Burkinabe are also suspected to be in their rank and file. 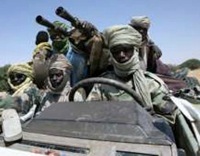 Hundreds of young Tuaregs from Mali and Niger are also among the mercenaries, according to elected officials in northern Mali. "We’re very worried", Assalat Ag Abdou Salam, president of the Regional Assembly of Kidal, said last week. "These young people are moving in droves to Libya. It’s very dangerous for us because whether Gaddafi wins or falls the impact will be felt in our region," he added. These men are a "lifeline" to the embattled Colonel Gaddafi and his shaky regime. He is aware that he can neither rely on the support of tribal leaders nor the army, which has in recent days suffered from massive defections. Reports claim that the mercenaries are, in part, from the "Islamic Legion". An army inspired by the French Foreign Legion, and which reflects the dream of Muammar Gaddafi who has been trying to create a United States of Africa with him as supreme leader. In his campaign 200 African kings and traditional rulers meeting in Benghazi in 2008 bestowed on him the title "king of kings". "We want an African military to defend Africa, we want a single African currency, we want one African passport to travel within Africa," Gaddafi had told the dignitaries. After its creation in 1972, this army was trained in southern Libya, and participated in the defense or toppling of many regimes. Including those of former Central Africa Republic president, Ange Felix Patasse, overthrown in 2002, and Chad’s Idriss Deby, whose regime had to deal with a rebellion in 2008, among others. According to the League of Human Rights Libyan mercenaries "led by two generals under the orders of the Chad’s ambassador to Libya, Daoussa Deby, Idriss Deby’s brother." However, Chad’s Foreign Minister on Friday denied that "Chadians from Chad or elsewhere had been recruited to serve as mercenaries in Libya." According to him, "Chad has no interest in interfering in the internal crisis of a neighboring country" he said. As well as firing live bullets to kill Libyan protesters, some of the mercenary groups are distinguished by their yellow helmets. In the past few days, a number of videos posted on the internet show them in action and reveal their presence in the country. Such violent scenes are seen taking place in Benghazi, a city in the east and controlled by the protesters. Several witnesses have also claimed that they were setting fires to buildings in order to give an impression of a chaotic atmosphere in the country. Meanwhile, the elements close to the Libyan "Guide" have denied their involvement. Muammar Gaddafi’s son, Seif al-Islam, recently described the idea that the regime was using mercenaries to bomb civilians as a "lie". Abhorred by a revolted Libyan population, the killers have become the subject of many rumors. One of those rumors, backed by a part of the international media, says that Muammar Gaddafi pays the mercenaries US$ 1,000 for every protester shot. Some even suggest between US$ 10 000 and US$ 12 000. And those who claim to have witnessed their enlistment, in Mali, say the rented assassins receive US$ 1000 per week. Unfortunately, many black African migrant workers from other countries living in Libya are bearing the brunt of the violence as Libyans continue to take them, voluntarily or involuntarily, for mercenaries. Insulted, threatened, beaten, chased, robbed, and sometimes even lynched, Black people are fleeing the country en masse for fear of reprisals. "The Libyans accuse us of being Gaddafi’s militiamen, African mercenaries," Mohamed Ali, a 40 year-old Sudanese engineer, who made it out of Zawiyah told reporters. "We’re just simple workers! ", said an outraged Saïd Musa, a 42-year-old Malian who worked as an employee of a Chinese company in Tiji, located in the western part of the country. "When the Chinese left, the village population jumped on us. They attacked us, they took everything from us," he told AFP. Ousmane Cisse, a 31 year-old Ivorian, was watching television at his home in the western city of Zouara when a number of Libyans "knocked on the door several times, it was 2.00am. They wanted to force their entry. They said ’get out, we’ll kill you, you are blacks, foreigners, leave.’" The reinforced door and burglar-proof windows saved Cisse and his family. According to him houses belonging to Nigerians have already burned down. And he is convinced that "blacks who come out will die." Black Africans from Mali, Sudan, Chad and Ghana, had settled in Libya to find gainful employment, and also to help their relatives back home. "I earned a double of my salary in Sudan," said Moussa, 33, a Sudanese worker who fled with his four children. These immigrants whose access to Libya was in part facilitated by Muammar Gaddafi, who has long advocated pan-Africanism, even prior to the popular revolt regularly fell victim to racism. Now their only goal is to return to their home countries. Meanwhile, the "Guide", who is now dependent on his macabre "death squads" to hold on to power, does not seem to mind the killing of his own people.